Transfer at Shizuoka Station to Tokaido Line bound for Numazu/Atamai, direction of Tokyo, and a 3-minute ride (one stop) brings you to Higashi-Shizuoka Station. 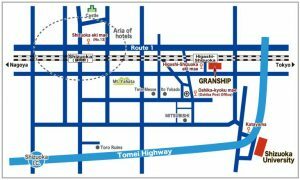 The venue, “Granship” is located next to the South Exit of Higashi-Shizuoka Station. Narita Airport → Tokyo Station: Take JR Narita Express. Reserved-seat only. Please buy a through ticket to Shizuoka. We recommend you to buy a reserved-seat of Shinkansen, bullet train, too,at the Narita International Airport Station. At Tokyo station, unfortunately we ask you to walk across the station from “Marunouchi gate” to “Yaesu gate” to change trains. Be careful! Some “Hikari” and all “Nozomi” don’t stop at Shizuoka. *Please see our URL, at the bottom of Venue window, for access from other airports. This Home page has moved from “http://www.ipc.shizuoka.ac.jp/~skearth/issm2008/index.html” on January 23, 2018. Copyright © 2019 ISSM 2008. Powered by WordPress and Stargazer.